J. Edgar Hoover, director of the Federal Bureau of Investigation, was enjoying his vacation with Clyde Tolson in LaJolla, California, an annual retreat the two men took together, when Patrolman Larry Minard, Sr. was murdered by bomb in Omaha, Nebraska. Hoover’s first awareness of the crime most likely did not come until two days later when he was called by Assistant Director Ivan Willard Conrad, the director of the FBI Laboratory. Conrad called Hoover on the last day of Hoover’s vacation, Aug. 19, 1970, to ask for directions on a request from Paul Young, the Special Agent in-Charge in Omaha, to accept evidence, but withhold a laboratory report. Young had sent a recording to FBI headquarters of the 911 call that sent Minard to a bombing ambush in a vacant house. Young wanted to turn the police investigation to the leadership of the National Committee to Combat Fascism, a Black Panther affilate chapter, and the tape recording of someone else’s voice presented a problem. Edward Poindexter and Mondo we Langa, former David Rice, were leaders of the NCCF and were specific targets of COINTELPRO, a clandestine counterinelligence operation of the Federal Bureau of Investigation. Young had been under growing pressure from Hoover to do something to get the two men off the streets. Minard’s murder presented the perfect opportunity to blame the Omaha Two, as the pair have come to be called. Hoover gave the okay to withhold a lab report on the identity of the anonymous 911 caller that lured Minard to his death. Conrad wrote a notation on an accompanying memorandum that he talked to Hoover who said, “OK to do.” Conrad dated and intitialed his notation regarding Hoover’s command. Hoover and Tolson travelled the next day back to Washington, D.C. In Omaha, Larry Minard, Sr. was laid to rest following the largest funeral in the city history. On Aug. 21, Hoover’s first day back in the office, Hoover gave Assistant to the Director William Sullivan a $250 “incentive award” for meritorious service. Assistant Director John Mohr likewise received a surprise $250 bonus. Although Hoover would use cash bonuses as part of his discipline system they were always earmarked for specific cases or achievement. Never before had Hoover given a subordinate extra money for covering the office in Hoover’s absence. The cash payments to Sullivan and Mohr are recorded in their FBI personnel files that have been made public. Ivan Willard Conrad’s personnel file has not been released so it is unknown if he too received a cash bonus. The unusual cash bonuses, so soon after the plan was made to withhold a FBI Laboratory report, suggests that Hoover sugar-coated a bitter pill to swallow–complicity in letting one of a policman’s killers get away with murder. Sullivan supervised all of the FBI domestic counterintelligence operations. Sullivan later alluded to the Minard case in his last public speech, indicating he was aware of Bureau actions in Omaha. Sullivan mentioned Omaha in a speech to United Press International editors and reporters although he was in error on the date of the crime. 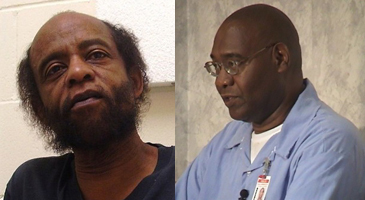 Ed Poindexter and Mondo we Langa were convicted in April 1971 of Minard’s murder and remain imprisoned at the maximum-security Nebraska State Penitentiary. The FBI role in the case was kept out of the courtroom. The jury that convicted the Omaha Two after a controversial trial never got to hear the recorded voice of the killer. Both men continue to proclaim their innocence. This entry was posted on September 22, 2015 at 4:21 am and is filed under Uncategorized. You can follow any responses to this entry through the RSS 2.0 feed. You can leave a response, or trackback from your own site.